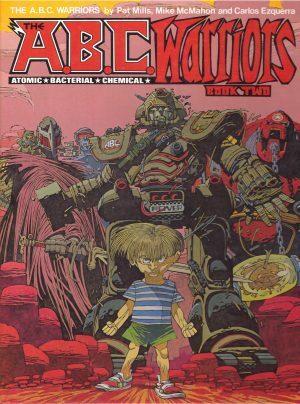 ABC Warriors has over the years been one of the strangest features in an innovative comic, and never more so than in these introductory strips from 1979 when Pat Mills was fired by thoughts of a wild adventure comic about robots. 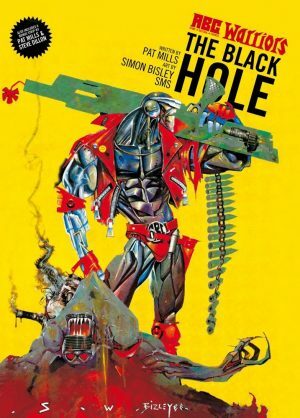 That never came about, which was unfortunate for Mills, but a stroke of good fortune for 2000AD readers as he funnelled his creative fervour into weird stories drawn by some fantastic artists. Where else are you going to find a 75 page collection featuring art from Dave Gibbons, Brendan McCarthy, Mike McMahon and Kevin O’Neill? Never mind with the option of a hardcover album as well as a standard paperback. The series grew from Ro-Busters, a feature Mills had tired of. One of the most popular stories in that run was former combat droid Hammerstein relating his Volgon War memoirs, and enthused by the idea of a Meknificent Seven, Mills set to work with O’Neill, whose pre-professional career had included self-published strips about robots. Hammerstein was a given, and to back him up Mills and O’Neill introduced a weird set of companions, one per chapter, starting with sniper Joe Pineapples who only communicated via brief letter and number combinations, and Happy Shrapnel, designed as a demented US Civil War veteran complete with beard. 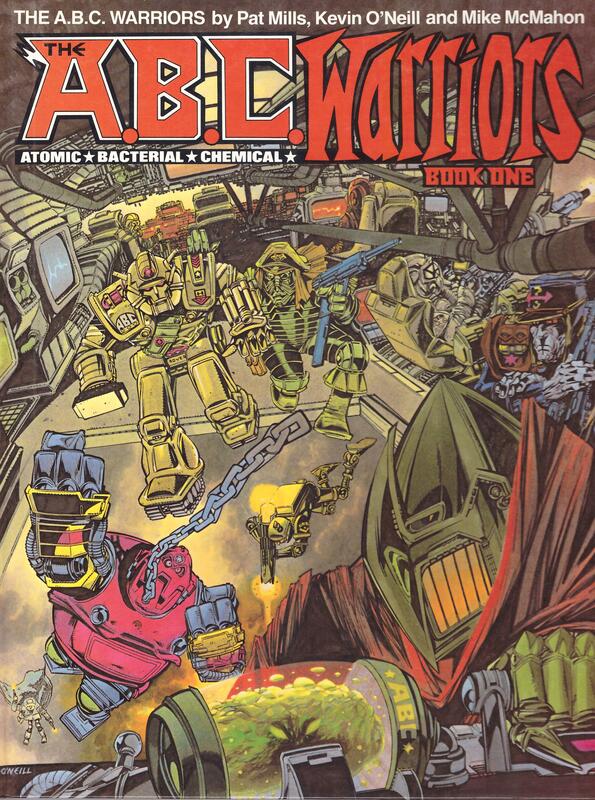 It had been intended that O’Neill (sample art left) and McMahon draw the entire series, but deadlines were shifted forward, only leaving O’Neill time for the opening episode, one later story and a three page epilogue concluding the first incarnation of ABC Warriors. As with Mills’ misfortune that initiated the series, O’Neill dropping out led to the succession of great artists, each picking up on his work, but also leaving their own stamp to match O’Neill’s initial enthusiasm and the standards he set. Only Brett Ewins doesn’t rise to the occasion, but he’s restricted to a single chapter. 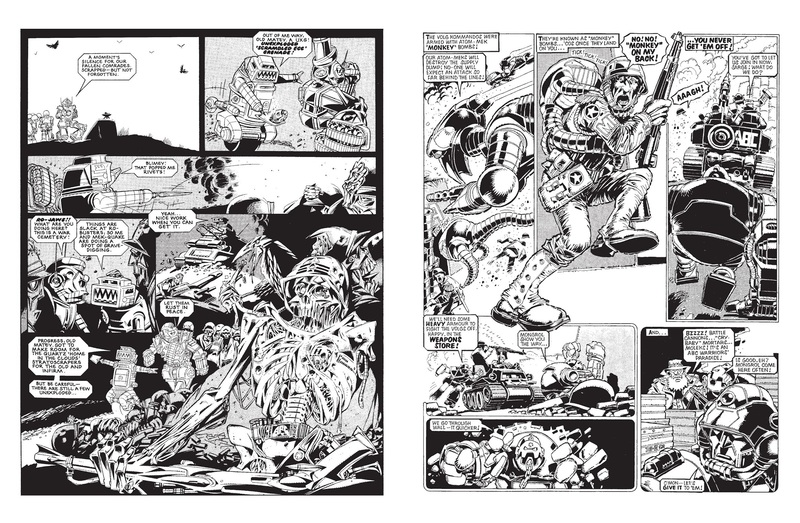 There is a flaw with reproduction being black and white, because several of the opening spreads were originally printed in colour, and these are considerably muddied. At only six pages per episode for a feature demanding large images, the scripts Mills produced were a frenetic energy rush, each one pared down to the basics and with one great idea after another thrown in. Some writers could base an entire miniseries on the idea of the monkey bombs seen on McMahon’s sample page. Mills throws them in knowing they’ll make for a great image, moves on and never uses the idea again. The ABC of the title stands for Atomic, Bacterial and Chemical, the types of warfare robots could supposedly withstand, and by the end of this book four more robots have fleshed out the team. Deadlock is a mystic, Mongrol strong and near mindless, the Hulk of the team if you will, guerilla warfare tactics originate with General Blackblood, and the Mess is an infiltration specialist. Book One ends awkwardly and arbitrarily, midway through Gibbons’ two part story, which would have been better transferred wholesale to the slightly shorter Book Two. In that the ABC Warriors continue their mission of taming Mars. As nice as the format is, the series is now more easily found combined with Book Two as The Meknificent Seven or on pulp paper gathered with other stories as the first Mek Files collection.